What is Assemble to Order Planning? What Are Assembled Products Versus non Assembled Products? Does Assemble to Order Provide Long Term Advantage? Where is Assemble to Order Enabled in SAP APO? Forecasting is normally performed at the finished good, but it can be performed at the assembly. To do so means understanding assembly to order planning and forecasting and knowing when assemble to order forecasting is appropriate. We cover where assemble to order planning is configured in SAP APO. Assemble to order planning is when final assembly is postponed, but when procurement is not postponed in advance of a sales order. In this article you will learn about how assemble to order is used, assemble to order affects forecasting and case studies of the assemble to order manufacturing environment. The topic of assembling to order is quite interesting. For instance, ETO & CTO translates to assemble to order planning. This means you have to figure out where to forecast (only at the finished good or both at the finished good and the raw material or component). Software salespeople will instinctively say that their application can meet a company’s requirement, but assemble to order planning is very different than make to stock or make to order. It’s easy to come up with a marketing document on “Assemble to Order, ” but it’s something else to design an application to be run this way. So the specific functionality and how it supports assemble to order should be demonstrated. Interestingly, there is some confusion regarding what assemble to order planning is. Assemble to order is very simply when the procurement plan is not based upon the finished goods forecast. In a standard make to order environment, the finished products forecast is created – and then the supply planning method (MRP, cost or inventory optimization or allocation) is run on this prediction. This is only an appropriate solution if the rules of make to order forecasting apply to the business. Assemble to order planning works well when a relatively few numbers of input products (raw materials, components, assemblies) can go into a relatively large number of output products (finished goods). When this is the case, companies that spend a lot of time on finished goods forecasting – for procurement – may not be forecasting in the best place. I say this specifically for acquisition because a finished goods forecast is still required for things like budgeting, sales & production. An important rule of forecasting is the rule of forecastability. This is often not explained, but the very act of forecasting implies the assumption that the item to be predicted is forecastable. For instance, it would be financially lucrative to forecast where the next major meteorite will hit the earth, and they film the event, but as the event cannot be predicted, there is the little point is trying. Forecast ability means that the effort placed into creating/adjusting the estimate is worth the effort of forecasting. Many companies presently create forecasts for SKU-Ls that are not worthwhile to predict. It is also another assumption that all SKU-Ls need to be predicted — that is not true. Forecasting is optional. One of the most important things a company can do is to analyze the forecastability of the demand history of its products and place their products into the buckets of forecast-able and unforecastable – as is explained in this article. But there is also the question of relative forecastability. Many companies forecast at the well-finished level, but the forecastability of their finished products database is lower than the forecastability of their raw materials. Various textbooks highlight the fact that supply planning is based on BOM explosion, which then creates dependent demand – and this is considered very positive. It is only positive if it can be demonstrated that the forecastability of the finished goods is higher than that of the raw materials. The history of demand can be used to create a finished goods forecast, but a company can also use raw material shipments to forecast raw material demand. One reason that the demand for raw materials for some clients is sometimes more forecastable than the demand for finished goods is due to the law of large numbers. A basic rule is that one should attempt to forecast at both the most forecast-able area – as well as the most relevant field. If raw material A goes into finished goods B, C, D & E, then forecasting raw material A will mean predicting an aggregated quantity and aggregated quantities beat out disaggregated quantities due to the mathematical law of large numbers. Another reason is when a condition exists when one raw material goes into various finished goods, the forecast error of any particular finished good (which uses the raw material) is not particularly relevant. In the example above, assuming a one to one ratio between raw material A and each of the finished goods that use it – if 400 pounds of raw material A is brought in on the right date, it makes little difference if the following forecasts are created. Any of these forecasts would be acceptable because they all result in 400 pounds of raw material A being consumed. When predicting at the finished goods level, the single prediction error of each finished good is measured, and effort is placed into improving the forecast – but as can be seen in the example above, this may not be the relevant forecast error. There is lots of effort spent on discussing forecast error measurement. The most important factor in evaluating any forecast error is the context of the error. And in this case, the area to measure the forecast accuracy is not even for the finished good. Assemble to order, or sometimes called (ATO) is one of the major manufacturing environments. The others are made to stock, engineered to order and make to order. Using this environment, companies will have some sub-assemblies already built, stocked and ready to assemble based on the customers’ requirements. Once an order is received, final assembly begins, and the product is delivered to the appropriate specifications. A key advantage of an ATO environment is minimal inventory is required, and the final product can be delivered quickly. The disadvantage is that the lead time to customer delivery is longer. The disadvantage is that the lead time to customer delivery is longer. Assembled products are products that have most of the complexity in the components or the assembly rather than the final stage of production. If we think of a computer, in its final form it looks complex. However, what makes a computer complex is the components. That is the microprocessor, the storage, the screen, the motherboard. If we think of the complexity that is contained in assembling a product like a computer, the work involved in manufacturing the microprocessor is many times more complex than assembling the product. So final manufacturing complexity is one component to what makes naturally assembled products. Another characteristic of assembled products is numerous configurations are possible. If there are few configurations, it makes little sense to postpone final production. However, if there are many configurations, it becomes more advantageous to delay the final production and to create a forecast at the assembly level. In this way, the assemblies can be used to make many different configurations with far less assembly and component inventory. Many products that we don’t think of as assembled products, for instance, automobiles, are in fact assembled products. This has been a change from older approaches to automobile manufacturing. Now large assemblies such as the engine, dashboard, wiring harnesses are shipped to auto “assembly” plants, and most of the complexity of manufacturing has been outsourced to suppliers. Therefore, when a product is an assembled product can also depend upon the setup of the manufacturing of that product in a moment in time. The assemble to order manufacturing method is appropriate for situations where a large number of sub-assemblies can be put together quickly to create a final product. The earliest personal computers were kits, and of course, early mainframes were assembled to order – made in a job shop environment. Once computers became mass produced, they moved towards a make to the stock environment. This persisted until an upstart used the Internet to take orders for make to order computer. The assemble to order model was made famous by Dell and coincided with the development of the Internet as a sales medium. There were countless articles about Dell and assembled to order which is what was proposed as a competitive advantage for Dell. But this brings up an interesting question. Dell was at one point a leader and picked up rapid market share, but their assembly to order model and online business model as not provided the longer term advantage Dell hoped to maintain. By 2007, Dell had stalled, and its once best in class quality and customer service had dropped. To increase sales, Dell moved to add a retail side to their business which has been attributed by analysts as improving the company’s outlook. However, selling computers in a retail store is a build to stock manufacturing model, not an assembly to order. Article after article talked about how Dell’s significant advantage was build to order generally, and assembly to order more precisely. The people writing these articles, by in large did not have a manufacturing background, and our inkling is that they oversold the benefits of assembling to order. Assemble to order is good, but a lot of computer buyers buy standardized computers, and thus build to stock is excellent for a large segment of the market. Dell makes gaming machines as well, and for this market, build to order is a better fit. To increase sales, Dell moved to add a retail side to their business which has been attributed by analysts as improving the company’s outlook. Selling computers in a retail store is a build to stock manufacturing model, not an assembly to order. Article after article talked about how Dell’s significant advantage was build to order generally, and assembly to order more precisely. The people writing these articles, by in large did not have a manufacturing background. My inkling is that they oversold the benefits of the assemble to order model. Assemble to order has benefits, but a lot of computer buyers buy standardized computers, and thus build to stock is excellent for a large segment of the market. Dell makes gaming machines as well, and for this market, build to order is a better fit. Assemble to order has benefits, but a lot of computer buyers buy standardized computers, and thus build to stock is excellent for a large segment of the market. Dell makes gaming machines as well, primarily through their acquisition of Alienware, and for this market, build to order is a better fit. Now, most computer builders both an assembly to order and a build to stock model working side by side. Apple has a very nice configuration site that when complete creates an assemble to order which is sent to the company’s overseas manufacturing arm. We are not sure but think its likely that the item is shipped directly from the overseas factory to the customer site. 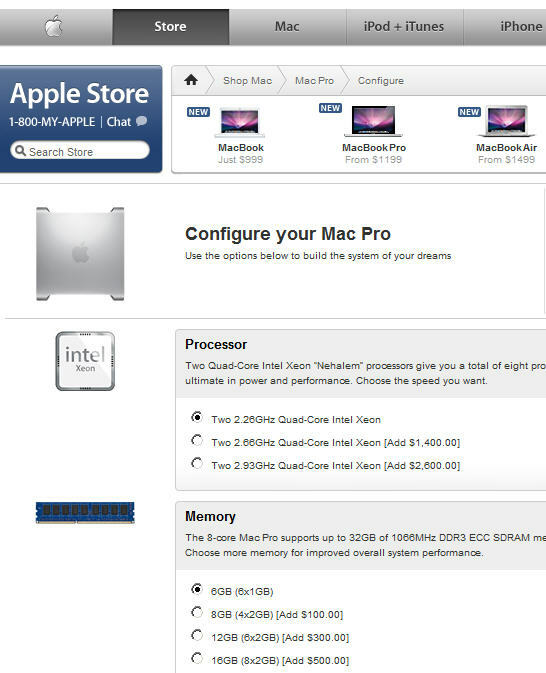 However, you can also buy a made to stock Mac from an Apple store. This is how almost all computer manufacturers work now, except for specific companies that build gaming boxes that only assemble to order, and servers, which are also primarily assembled to order. Assemble to order can be configured to work in SAP APO. PP/DS: PP/DS must plan and schedule the production, while GATP – if employed – uses Multi-Level ATP to inter-operate with PP/DS to provide an available to promise quantity back to either SD or CRM. SNP: SNP can be set up to use assemble to order consumption. DP: Assemble to order means that the forecast is created not only for the finished good but the components. This increases the number of items that must be forecasted by the system. So in this respect, it is a disadvantage. If the components are shared among the finished goods, then in some cases the forecast error can be lower. That is it can easier to forecast at the component level and the finished good. This means that DP will send forecasts for components to SNP or SAP ERP. GATP: APO can check, using GATP as to whether there is the component inventory to schedule an order. How PP/DS enables assemble to order is more complicated. Many companies that are an assembly to order are continuing to forecast at the finished good – because this is the way that most systems work, and this is the experience that most people that work in supply chain planning have. Companies that have the situation where a relatively few numbers of raw materials to into a relatively large number of finished goods need to analyze where they are performing forecasting for procurement. This can be easily accomplished by using the same forecasting software that one is already using on the finished goods and applying them to the raw materials. One good indicator is the number of raw materials versus the number of finished goods. If a company has roughly 2x to 3x as many (or more) finished goods as raw materials, they may be a good candidate to base their procurement on raw material forecasts. Testing will be able to say definitively. Once the switch is made the question becomes what to do with the finished goods forecast. Some companies will want to continue to create it – but not all businesses. For instance, some firms have short production lead times. These companies only require a forecast for procurement. As long as they have the material, they are better going off of sales orders. This is the prototypical assemble to order environment. There are quite a few companies that have these requirements, yet very few that plan this way.